Make sure your inventory is accurate and updated as necessary. Some commonly forgotten things: items in the attic, garage, patio, shed. Keep your building managers/property owners informed of moving details, if necessary. Ask if they require a Certificate of Insurance (COI), find out where the movers should park and what hours you can use the elevator. Also, is there any time restriction for the movers. Get your belongings boxed up! (Or request professional packing service). If you did not purchase packing, remember to unpack cabinets, drawers, and desks, so the movers don’t have to do it for you and charge an additional fee. Be sure that anything you don't want to be loaded with personal items and high-value items you plan to carry separately is apparently set aside for the things to be moved. Example: jewelry, passport, keys, travel essentials, toll pass, plane ticket. More information: I booked my move! What should I do next? What if I need temporary storage for my move? If your move-out and move-in dates are different for local moves, you will need storage services. Also if you are Moving long distance and you can not accept delivery on the 3rd day after you Pick Up I completed, you will need storage service. Prices are calculated in 30-day increments, and we will safely store your belongings in our warehouse. More information: What if I need temporary storage for my move? More information: What if I want to add items after I booked the move? More information: I Can't find an item on your Online inventory list? Can I Schedule my move tomorrow or day after tomorrow? Give us a call, and we'll try our best. Moving on short notice will not impact your price for local and long-distance moves. Cost can be significantly higher only if you narrow your pickup window to one day just for long distance move. More information: Can I Schedule my move tomorrow or day after tomorrow? For the best price, we recommend booking at least one month ahead in the busy season (May- December) and two weeks ahead during the Winter and Fall. For the long-distance moves, we require flexibility with two-day pickup window. You will be notified 48h in advance what is your move date. More information: How far in advance should I book my move? What is included in my Move? ✓ Tolls, Gas, Mileage, and Taxes. ✓ Detailed Itemized Inventory List. ✓ Special Moving Blankets to Wrap and Protect Your Non - Fragile Items. ✓ Basic Disassembling and Assembling of Basic Furniture (if needed). ✓ Full Standard Valuation Protection at the rate of 0.60 per pound per article. ✓ Up to 75ft of long carry counting from the truck to the entrance to your Home. ✓ Up to 10 steps ( Stairs)counting from the truck to the door to your Home. ✓ Packing and unpacking if indicated on your estimate. ✓ Loading and unloading and furniture placed & set-up at destination. More information: What is included in my Move? What informations do you need from me for the price calculation? Required information for the price are your: name, pickup zip code, delivery zip code, phone number, email address and completed Visual online estimate. Everything else is optional until you decide that you want to book your move. More information: What informations do you need from me for the price calculation? What is happening with my data and personal information? More information: What is happening with my data and personal information? How do you calculate the price of my move? Additional services such as packing, more than a one flight stairs, etc. More information: How do you calculate the price of my move? Do you service international moves? Unfortunately, We are not servicing any international moves. We hope we will able to add that service anytime soon. More information: Do you service international moves? Three things can happen. Either We are overbooked on that specific time and date. We do not service local moves in your area ( right now we are functioning local moves only in IL, MD, VA, DC, GA). Or you are moving long distance outside of our area of operation. We're growing every day and adding new states. More information: Why is Zip Moving not available for my move? What should I do after I booked the Move Online? When you order a mover online, you will receive a call from Moving Coordinator explicitly designated to your move.Your Moving Coordinator will answer any questions or concerns for you and ensure that everything goes smoothly. More information: What should I do after I booked the Move Online? Your estimated price is guaranteed not to change unless you order additional services, add other items to be moved, or extra weight to be moved which are not explicitly disclosed to the Zip Moving and Storage. Please carefully review your estimate for accuracy. If you make any changes to the list of services ordered or the items to be moved, you must notify us before your move date so an updated estimate can be issued to you and last minute price changes can be avoided. If on the time of the move you order last minute services or have additional items to be moved the mover will issue you a new updated written estimate reflecting the change to the total estimated price. More information: Is my price guaranteed? Why Should I use your Online Visual Estimate? We want to keep your relocation process more comfortable and more transparent. In moving industry it’s challenging to get a price for your move unless you speak with the salesman, and we want to change that. Booking your move with Zip Moving is easy and saves you time and money, you can get a price 24/7. All you have to do is just go online and enter your move details and get the guaranteed price based on the circumstances you provide. However, if you prefer to speak with someone over the phone regarding your quote you can do that also just call 855-947-6543 and someone will assist you. More information: Why Should I use your Online Visual Estimate? The Help Desk is also closed for certain Holidays. More information: What are the hours of operation for the Help Desk? A Non-Binding Estimate/Quote is an estimate of what the mover believes the total cost of the move will be based on the estimated weight or volume of the shipment and the accessorial services requested. The moving company will base the final charges on the actual weight/volume. If Weight goes up, Moving company can charge a 110% of the Estimated price (Estimated price + 10%). More information: What is a Non-Binding Estimate? What can I not move with a moving company? You may or may not be aware that some common household items are prohibited in the moving truck. For safety and insurance reasons we cannot allow specific items to be packed inside the boxes or loaded onto the truck. Please notice that foodstuffs are included in this list. A Binding Estimate simply means that the price quoted in the estimate is the amount you pay at the time of the delivery. The moving company will base the final charges on the actual weight/volume. If the shipment weighs more, the estimated amount is required at to end. Everything else would be the bill to you after 30 days. A Non Binding Estimate/Quote is an estimate of what the mover believes the total cost of the move will be based on the estimated weight or volume of the shipment and the accessorize services requested. The moving company will base the final charges on the actual weight/volume. If Weight goes up, Moving company can charge a 110% of the Estimated price ( Estimated price+10%). More information: What is a Binding Estimate? What is a Revised Written Estimate? A revised written estimate will be used if, on the day of the move, the customer decides to ship additional items, request additional packing or services than what was included in the original estimate. This revised written estimate cancels the original moving estimate and replaces it with the revised written estimate. The Revised written estimate must be signed prior packing and loading the truck. Must be Detailed enough with additional items, estimated weight or Cuft of every item. The moving company can cancel the move if those services are not possible to be performed by the moving company ( Example: military shipment, the destination is being changed to the area that is outside of operation radius ). The moving company can decide to only ship the items that were listed in the original estimate if the customer agrees. The moving company can ship the additional items without RWE if the driver feels that the weight or Cuft of the whole shipment will still be under the estimated weight. The moving company can ship the additional items without RWE and bill the customer after 30 days. Revised Written Estimate can be Binding and Nonbinding. More information: What is a Revised Written Estimate? The bill of lading is the CONTRACT between you and the mover. The mover is required by the law to prepare a bill of lading for every shipment it transports The driver who loads your shipment must provide you with a copy before loading, signed by the driver and by you. Please read and understand the bill of lading before you sign it. The bill of lading identifies the mover, specifies the terms and conditions, total estimated charges and the valuation coverage of your shipment and the amount the mover will be liable for in the event of loss or damage to your shipment. The bill of lading is an important document so be careful not to lose or misplace your copy. Have it available until your purchase is delivered, all charges are paid and all claims, if any, are settled. More information: What is a Bill of Lading and Order for Service? More information: What is an Inventory? How my movers will count and confirm the inventory? Movers will count and record every piece of furniture and box, and then ask you to verify their list. All of the items will be numbered with the stickers and noted in the inventory sheet accordingly. More information: How my movers will count and confirm the inventory? You will be asked by your movers to sign a “Bill of Lading,” “ Valuation Selection,” “ Packing Materials order form,”“Service Order Form,” “ Delivery Information form,” “Revised Written Estimate” if applicable and an “Inventory list.” This paperwork gives the movers legal permission to move your belongings. Please make sure you understand everything carefully before signing, and contact us with any questions or concerns. More information: Do I have to sign any paperwork? Why is my delivery window so wide (Long distance)? There is a lot of Factors that determine your delivery window. Example- If you're making a long distance move, and you are moving to GA, AL, FL, TN, SC, IL, IA, IN, MI, PA. WV, VA, MD, DC, DE, NJ, NY we can deliver your shipment in just a few days. When you receive your estimate from us, you will see a delivery window on it. This same range of dates will also be on your bill of lading. This range of dates will determine when your shipment will be delivered. For long-distance moves, the date range will be anywhere from 2 days to 17 days. Please take a look at the table below. More information: Why is my delivery window so wide (Long distance)? Their contact details (email address, office phone, and fax numbers). More information: What is a Certificate of Insurance (COI)? Ask your movers what size truck they plan on dispatching for your move, especially if you're concerned about space or parking is an issue. If there are limitations to the size of the truck, let your mover know as soon as possible. Keep in mind that the movers may not set the specifics for the day. Before your move date when the next day's schedule is completed. As of right now, we are using only 26ft trucks for local and long-distance moves. Our 26 ft truck rental is ideal for five to seven rooms — the right size for moving a 3-5 bedroom home. We at Zip can fit in those trucks up to 12,000 lbs. If you move exceed 12,000 lb we will dispatch two 26ft trucks. More information: What size of moving truck is for my move? The first thing your moving company will do is walk through so you can give them more specific information regarding your Move if there is anything in the house that should not end up in the truck also point any items that you need a special care.After that driver will complete a written inventory of your goods, assessing each item's condition and assigning it a number for the inventory. Also, a driver will explain all the paperwork that is regard so we can legally transport your belongings to your new place. After the paperwork is completed, the movers will protect your carpet and start unloading blankets, tape, boxes, etc. anything that they need to start protecting your furniture.If you purchased additional services like professional packing, the movers would do that before loading the truck. If you already packed your boxes, they will load that in the truck first to create enough space for padding your furniture. Loading the moving van is last, and it is determined, so that cargo space of a truck is used most efficiently. Each piece will be blanket wrapped before is taken from the house to the truck, and the movers will load the truck from floor to roof. Heavy furniture will go at the bottom, boxes in the middle and fragile items on the top. Items would be stacked next to each other to prevent shifting of the load. The movers may bring pieces from different rooms and mix it in the truck to ensure a tight fit but every item is labeled from what room is coming, so at the delivery, you will be able to tell the movers exactly where you want each piece placed. More information: What should I expect on my Move day? More information: Can I ask the movers to connect a dishwasher? If you have decided to forego our professional packing service and organize your household without help you may find yourself with many questions. Let our expertise be your packing guide and examine our detailed list of the types of moving boxes available. Please know we are available for any questions or if you decide the workload is overwhelming. We are happy to assist you with packing and wrapping. To begin the packing process you need to start with the size of the moving boxes you need. First, familiarize yourself with the items you will be packing and think of them as belonging to one of three categories: heavy, bulky, and fragile. Some items may fit into one or more of the categories, but you get the idea. For heavy items, you should consider using small and compact book boxes. Can I pack and ship my plants? Movers will not ship living plants for long distance moves per federal regulations. Many states require special inspection for the plants. Additionally, extreme temperature and lack of sunlight in the truck can be fatal, so double check with your mover before you pack your plants. More information: Can I pack and ship my plants? Can I leave my clothes in my drawers? To ensure the safe transportation of your furniture, you will need to empty all of your drawers. All of your items should be packed into boxes; this will help prevent loss and damage. Keep in mind that if the furniture full of clothes and linens is too heavy, it can cause your furniture to crack while in transit; the movers will also have a hard time moving your furniture if that peace is very heavy. More information: Can I leave my clothes in my drawers? Can I ship my clothes and linens in a plastic garbage bag? You must not transport your items in garbage bags. The plastic garbage bags are not designed for transport, and they might rip, causing your things to fall out and become dirty, stained or even lost. More information: What should I do if something is damaged? What if I have less stuff than listed on my move day? Everything is based on weight or CU ft, if you have less items you will be charged less. More information: What if I have less stuff than listed on my move day? Just ask your moving coordinator how many movers they are planning on dispatching. Keep in mind that the movers may not set the specifics for the day before your move date when the next day's schedule is completed. For Local moves an average there are three guys unless ordered differently. For long distance 2-3 guys. More information: How many movers would be sent out on my move? Movers will provide you with the arrival window 48h and 24h before. Also, a Crew leader will contact you at least TWO Hours before their arrival. If you need to guide them to the loading dock reach out to your moving coordinator and he would be able to tell you there exact location. More information: I'm waiting for my movers, should I give them a call to see what time they'll be arriving? More information: How can I find out that movers are coming? How long it can take to complete my move? This is only a guide; every home is unique. If you have long carry, stairs unusually tricky disassembly and assembly this time can vary. More information: How long it can take to complete my move? Can I add additional pickup or delivery location? To add additional pickup or drop-off addresses select 'additional delivery stop off' or 'additional pickup stop-off' in Online Moving Quote. You can add this service after you booked a move. For every Additional Stop off there is associated fee. For more than one place call the office 855-947-6543. More information: Can I add additional pickup or delivery location? Am I able to change my move date or time? If you need to change your move date and time, log in to your account and simply change a date or time. Also, you can email info@zipmoving.us.com or give us a call at 855-947-6543, and we will replace the dates for you. Keep in mind that there would be a fee when rescheduling three days before the pickup or delivery date. More information: Am I able to change my move date or time? Moving long distance without a destination address is pretty standard, especially if you’re moving suddenly for work or family. Many times, people might know the city or region of the state they’re moving to but aren’t sure about the exact location Simply enter a nearby zip code of the city/state where are you planning to run. You can update your addresses after you book the move. More information: I don’t know the exact address where I'm going to? Should I buy insurance for my move? If you have high value and rare items, we strongly recommend purchasing additional moving insurance. Mandated by the Federal Law interstate movers must offer two different liability options ( Valuation coverage). Under Full Value Protection, your mover is liable for the replacement value of lost or damaged goods in your entire shipment. If any article is lost, destroyed or damaged while in your mover's custody, your mover will, at its discretion, offer to do one of the following for each item1)Repair the item to the extent necessary to restore it to the same condition as when it was received by your mover, or pay you for the cost of such repairs 2)replace with a similar item, make a cash settlement for the cost of the repair or the current market replacement value. The Value of your goods will be deemed to be equal to $6.00 multiplied by the weight of the shipment. Should I disassemble my furniture and beds? It’s better not. Movers will only assemble items they've disassembled. So leave all the beds and furniture that needs to be disassembled for movers, they are trained to disassemble basic furniture and not to lose the hardware. Disassemble and Reassemble Beds, all the tables and other standard furniture with just a few screws. Disassemble and reassemble mirrors off of the dressers. Unhook Electronic wires from Computer, Stereo, etc. Unhook Washer, Dryer, and Stow. Disassemble Large Multi-Piece Entertainment Center. Unmount a TV from the Wall. Take down pictures and mirrors from the wall. Disassembling a Baby Grand Piano. Hanging pictures, mirrors, TV’s and Drapes on the wall. Remove or attach lights, chandeliers from the ceiling or the wall. Electrical. Plumbing, washer-dishwasher-staw connecting at the delivery. Reassembling furniture the movers did not disassemble. More information: Should I disassemble my furniture and beds? If you're due a refund, we will send you the amount due in the form of a check to your destination address we have on file. We'll re-confirm your address before we send out the check. Please keep in mind; refunds will arrive up to 6 business days after your move is completed. More information: If I'm due a refund, how and when will I get it? Should I tip my mover? More information: Should I tip my mover? Will I need to pay anything for move day? Only if you are aware of the payment at the time you booked the move. If you requested a Storage Service for the extended period, we would ask you to pay up to 50% of your remaining balance at the time of the pickup. If you have regular move, we do not ask for any payments on your move date. (except for a tip, should you choose to give one). More information: Will I need to pay anything for move day? Are there any hidden fees or additional payments? No hidden fees or additional payments on your move date. All of the charges are listed below you just have to be upfront with the movers ( Example: when you moved in to your place, your sofa could not fit through your door and had to be moved in through the balcony or window and if you do not disclose this information to your movers there would be additional fee for Lowering & Hoisting at the time of the pickup. Service Fee- Weight or Cuft ( weight or Cuft of your items X price per pound/cu ft ). Cost of packing- Boxing up or protection fragile furniture. Cost of unpacking- Apply only if movers are required to unpack boxes. Accessories- Stairs, Long Carry, Shuttle, Re-Delivery fee- Waiting Service, Storage Service, Bulky Or Heavy items, Lowering Hoisting, Wood Crating, Elevator Fee, Extra Pickup and Delivery, Guaranteed Delivery( One Day delivery window), Re-Scheduling your move 72 before your pickup or delivery. Service fee: Time multiply by the hourly rate ( Example 4h X 125$( 1 truck three man). More information: Are there any hidden fees or additional payments? If I cancel my move will I be charged? Contact the movers at least 48H before your move, and there would be no cancellation fee. Otherwise, a 10% cancellation fee applies. More information: If I cancel my move will I be charged? Additional charges may apply if? There are additional items ( lbs, Cu Ft). You requested other services from your movers (example: asked movers to help you pack boxes). 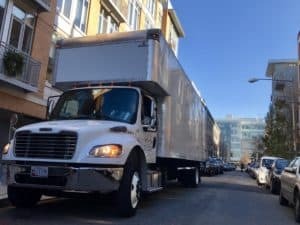 The conditions of the job changed (example: there is no space to park the truck in front of the apartment, and now movers must walk more than a 75ft from the truck to the entrance to your doorway with your furniture). If there are more than a ten steps ( Stairs ) between the truck and your front door and you did not disclose this information when you booked the move. If the movers have to wait to get access to your current or new home, there will be a Wait Time fee(example: movers can't start the move right away because you are not ready). If our truck can’t fit into your new neighborhood and a smaller moving truck is required, there will be a Shuttle fee. More information: Will there be any additional fees? We accept major credit cards Visa, Mastercard, Discovery. Certified check ( Cashier's check ), Money order, cash. We do not take American Express and personal checks. More information: What form of payment are you accepting? After the initial deposit, subject to a Federal law payment in full of all charges is required before delivery and before unloading( Subject to the 110% law if applicable ). We will send you an invoice couple hours after your move is completed. You can submit the payment anytime after that; you can also wait for the driver to arrive in front of your new home and driver will help you with the payment. More information: When I will be charged for my move? More information: How can I save money and get the best moving price?